Absoltuely gorgeous Lilit! I'm actually really surprised at how stunning it looks! Totally trying this sometime soon! Looks awesome, I love how you tied it in with the rest of your makeup, very summery! Anni - you totally should try it, I can just see you rocking it my lipstick loving sista! Rae - Thanks! I did worry about whether it's suitable to be worn on lids, but so far so good. Grace - he he, yeah I was a bit matchy matchy, but with the warmer weather here only brights would satisfy me! that is such a pretty blush. As you know I obsess with peach blushes! So nice as an e/s too...clever girl! Omg! Why have I not thought of that?! I've been looking for the perfect peach colour for ageees! The shade looks great on you! I've never had a peach blush that colour, but after seeing this one I might go find one.. It's simply gorgeous! How lovely! And I especially love the orange earrings to match, beautiful! I've worn Bare Minerals blush in Fruit Cocktail before as an eyeshadow. It's shocking pink and fun to experiment with! 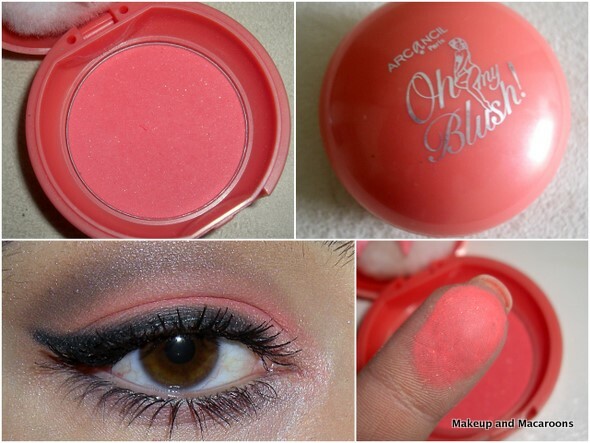 Mercedes - your blush collection is just to die for, die for i tells you! arsyparsy - it's really similar in colour to Tarte Tipsy, it's a gorgeous colour isn't it? Rachel - yeay, try it! You'll love it! Gianna - it's a gorgeous colour, it's very similar to Tarte Tipsy. I can't think of any other dupes though, so hope you find something similar. Laura - ooh that would look amazing against your skintone, I love the idea of the shocking pink lids. Dib Dabs - Cool, try it, you'll love it! Gaelle - cool, you totally should try it! Feel free to link back here, I'd love to see what you come up with! That looks gorgeous! I want that blush it's such a nice colour. It's always fun to mix things up every now and then! What a beautiful blush Lilit! I've heard of blush being used as shadow but I've never tried it myself. The farthest I've gone is wearing a highlighter on my eyes but that's not really adventurous - I think I should get out of my comfort zone because it really does look gorgeous on you! Wow Lilit I love what you did! love the look, such pretty colours!! oh wow i love that color. it looks so pigmented! The blush as eyeshadow thing doesn't typically work for me: I find that a lot of blushes blend to become too sheer for use as eyeshadow. I love how your earrings match, adorable! Thanks for all your comments ladies, you should definitely try this if you're after a bright eyed look. VijiiS - I used an eyeshadow primer to make the colour stick on the lid better and look more pigmented, otherwise it was too sheer on the lid. This look is so fun! :) Coral is so your color! I adore this shade as an eyeshadow. I'm always looking for a similar eyeshadow shade and yes, have sometimes resorted to using a blush. <3 Perfect! How did I not see this post the first time around...? I LOVE coral and peach, and will DEFINITELY be trying this. I have the same earrings, too! Your makeup is really gorgeous, pops very well against your skin. May I ask what lip stain you're wearing? It's Inglot lipstick in #104.